More than 40 years ago, Tun Sovan arrived in the United States as a student. When his own country, Cambodia, plunged into war and chaos, Tun Sovan found shelter in the U.S. as a refugee and built a new life as an immigrant. He went on to work for more than 35 years in federal and local government in the greater Washington D.C. area and participated in a long list of civic groups promoting the Buddhist faith, religious dialogue and immigrant affairs. He has met the Pope twice. “The United States is special,” Tun Sovan said, referring to how the U.S. was built by immigrants based upon the principles of freedom, granting shelter, and providing opportunity. “One should not forget that the United States has the principle,” he said. Now in his mid-70s, and an active community leader still, Tun Sovan believes the U.S. continues to be a “country of opportunity,” and that it must never lose its founding principle of being a shelter for those who, as he was, are unable to live in their own country. Tun Sovan’s message resonates with many in America where immigration has emerged as one of the defining issues of the 2016 presidential race, and as President Barack Obama prepares to host a global summit in New York on September 20 to address the world refugee crisis. Obama wants global leaders to increase funding for refugee humanitarian efforts, increase refugee resettlement, and provide more opportunities for those seeking refuge. “The summit is by no means a panacea,” Samantha Powers, US ambassador to the United Nations, and herself an immigrant, said in a speech in June. “Even if we hit every target, our response will still not match the scale of the crisis. But it would represent a step – an important step toward broadening the pool of countries that are part of the solution,” she said. The subject of refugees and immigrants has become a divisive subject in the United States. Republicans have criticized the Obama administration’s plan to resettle 10,000 Syrian refugees during the current fiscal year, saying it could put Americans at risk from terrorism. As the beneficiary of a scholarship to study in the United States in the early 1970s, then as a refugee during Cambodia’s civil war, and now a U.S. citizen of 40 years, Tun Sovan understands the debate firsthand. He agrees that the government must take action against terrorists, but those actions should not overshadow the country’s long history of helping refugees and welcoming immigrants, he said. The US became a developed country because of immigrants, Tun Sovan said. Speaking at a Cambodian Buddhist temple in Maryland where he does volunteer work, Tun Sovan shared a story of similar antipathy toward Cambodian refugees decades ago in Virginia. Efforts by the local Cambodian community to establish a Buddhist temple were being prevented by a local woman. The woman, Tun Sovan said, was blunt in her opposition to the temple, saying she didn’t want immigrants in her area. Tun Sovan said to the woman that, although she was not an immigrant now, she had forgotten that her parents were immigrants once too. The value and contribution of immigrants to the US must not be forgotten or underestimated, he said. After receiving a PhD in economics from the University of Tennessee 1979, Tun Sovan worked in local government and in the US Equal Employment Opportunity Commission (EEOC), a federal agency in charge of investigating discrimination in employment. In his spare time, he now devotes himself to helping his fellow Cambodians and other refugees to the US, and promoting understanding between faiths. Among his many roles, he is president of the Cambodian Buddhist Society in Silver Spring, Maryland; vice president of the Washington DC Buddhist Network; founding member of the International Buddhist Association of America, and a member of the board of directors of the Interfaith Conference of metropolitan Washington. Pope Francis invited Tun Sovan to participate in a Buddhist-Catholic dialogue in the Vatican in June 2015, and he met the Pope again during his visit to the United States in September. A commissioner for the Maryland governor's Commission of Asian and Pacific American Affairs since 1998, he is a founding member of the Immigrant Empowerment Council (IEC) of the Washington Metropolitan Area, and is on the Friends of Khmer Culture board of trustees. Tung Yap, a resident in the Cambodian community in Virginia, said Tun Sovan is known for his work at the Buddhist temple and as a focal point of contact between the Cambodian community and the government. 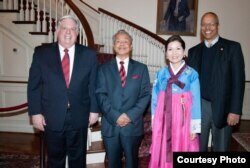 “I see that he went to meet with [the]…state governor, senators, other congressmen,” Tung Yap said. Schanley Kuch, a Cambodian resident of Maryland, said Tun Sovan is well known for his service to the diaspora, particularly his efforts to unify the different Cambodian communities in the US. “He pays attention to the needs of the people and he serves the culture,” Schanly Kuch said. There is still one more thing Tun Sovan hopes to achieve. He would like to see a Buddhist ceremony held at the White House just as other religions have been honored. Each year, Tun Sovan said, President Obama has sent a letter to Buddhist associations to mark international Visak Bochea day, which celebrates the birth, death and enlightenment of the Buddha. “But we don’t want only that, we want to hold the ceremony in the White House,” he said. However, with just a few months left in President Obama’s term in office, Tun Sovan believes his dream — as with so many things in the US — is possible, but it may have to wait. This story was reported by VOA's Khmer service.